Choice shelf stable blue raspeberry syrup comes in a 5:1 mix. It is sold as a case of 6x1/2 gallon bottles and youlds a total 2600 ounces of frozen product. 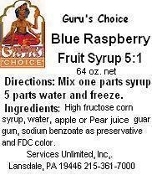 The syrup is made with blue raspeberry puree and juices. Because of the weight of the prouduct it must be ordered with a minimum of 15 cases to be delivered on a skid. Come in and pick up in store today. Please call in to ask about ordering a single case to try our product. Mixed cases with any of our other flavors can also be avalible.